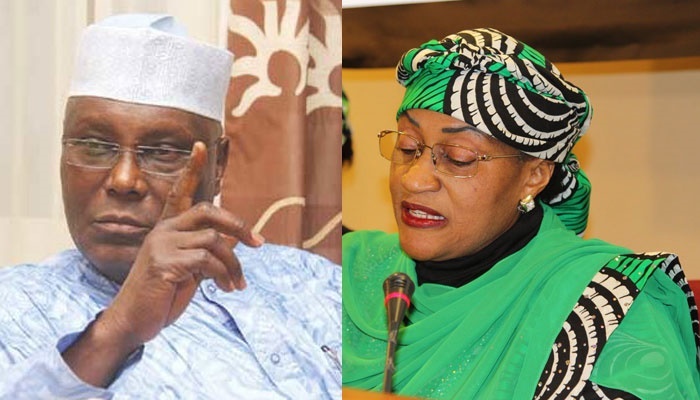 Mama Taraba may know something that Nigerians do not know about 2019 election and that may have triggered her campaign for Atiku Abubakar. Or Is she a prophet? Mama Taraba, as she is now called, is the Minister of Women Affairs, Aisha Jumai Alhassan. After her outburst on Wednesday many believe her job may be on the line. This comes after she was caught on camera addressing a former Vice President, Atiku Abubakar, as Mr. President. Some said it was a 'miss-fire', others said she may be realistic. Atiku has not publicly declared his intention to run in 2019 but there are fingers pointing towards his direction. Some people are gunning for him to run for office with several others calling on him to return to the Peoples Democratic Party. President Muhammadu Buhari, whom, in lay man's term, employed Mama Taraba, has not also declared his intention to seek a second term. He has much more issues to tackle at the moment - His health comes first among these issues, after all it is only a living man that will campaign in 2019. Both men are members of the All Progressives Congress and the party is yet to decide who its flag-bearer will be in 2019. This uncertainty from both sides seems to be clearing up as Mama Taraba, who is an insider and supposed ally of President Buhari, may have access to classified information. Mama was not concerned about what her official master, President Buhari, will do. She apparently wants to pitch her tent before the storm and reality of 2019 begin to drizzle. These are some predictions and realities that Mama Traba may be acting on. 1. The Peoples Democratic Party (PDP), which was in leadership position for 16 years before APC took over in 2015, has approached Atiku who was one of the founding members of the PDP, asking him to return. Mama Taraba may be aware Atiku will take up that call when the time comes. 2. If Atiku returns to the PDP, he will be among top persons that will vie for the Presidential ticket of the opposition party. Mama Taraba may also be aware of this. 3. Mama Taraba is also aware that President Buhari needs to take care of his health and may not be interested in 2019. She may have put the cards on the table and seen there will be a possible 'Divide The Northern Vote' strategy and allegedly wants to try her luck on the side of Atiku. Political analysts predict more cross-carpeting will follow in coming months and there may be a major cabinet reshuffle before December 2017. What else does Mama Taraba know that we do not know? Watch a video of Mama Taraba campaigning for Atiku.